With AbActive™, horse owners can be confident of using a product that ensures that their horse is receiving a beneficial natural product. 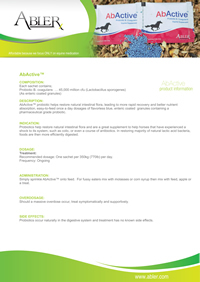 AbActive™ equine probiotic granules contain beneficial natural products that will ensure the treatment of horses quickly and easily. Rapid dietary changes - either changing from pasture to concentrated feed.